Record 1080p video & audio directly to a USB Drive from HDMI! 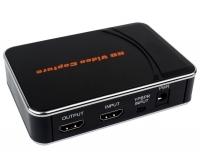 Record footage directly from your gaming console's HDMI output! Captures and Records up to 1080p Full HD from any unprotected HDMI source - especially suited to saving your best gaming moments to disc for upload! Become a Youtube sensation! Recording your gaming footage has never been easier with a Full HD 1080p HDMI Capture Recorder. Simply plug your HDMI device into the recorder box, plug in a USB flash drive, then connect your TV or monitor into the HDMI pass-through output socket. That's it! At the push of a button, you can record your game footage straight to your USB storage device, including portable Hard Drives or USB flash drives (sold separately here) at full HD 1920x1080 and a steady 30fps. All your video and audio is recorded into AVI MPG4 files (segmented into 2gb files) by the onboard encoder at up to 18Mbps data rate. At full 1080p, you get about 15 minutes per segment before it splits into a new file. Editing software bundled with the unit makes it easy to crop, trim, edit and add post-commentary and intros to your videos for upload to video sharing sites like Youtube. It couldn't be easier! The capture device introduces a minor amount of input lag, so you may be at a disadvantage for competitive play, but general rough-housing, let's plays and casual fun can be effortlessly recorded. YPbPr capture is also supported for PS3 recording, or if you're rocking an old-school console - and you can also loop your Mic through if you want to record your headset audio too! Now you can have the affordable HDMI & Component capture device for all your gaming consoles, including XBOX (all generations), Playstation 3 (via component) and PS4, WiiU and more. Please note that for Playstation users, you may need to 'Enable HDCP' first. Includes: Manual, Software CD, 30cm HDMI Cable, YPbPr breakout cable and the capture unit! Note: This unit does not record HDCP protected content. Use your own editing software! Answer: "HDCP protected content will not be recorded. For example, the recorder device will pass-through a Blu-ray to show on-screen, but the recording function will not activate. This device cannot 'get around' content protection, as it is against the law to do so." Answer: "If you are using an iPad to HDMI Cable adapter, then you can record the iPad's output when in Mirrored mode. However all copy-protected content (eg: Movies on iTunes) would be subject to the usualy HDCP copy-protection and would not be recordable." Answer: "No. This device saves footage to 15 minute segmented avi files on a USB storage device. It does not provide a live stream." Answer: "Yes. If your existing VHS / Mini-DV devices can output YPbPr Component video (or HDMI) this can capture the footage. The only drawback would be the segmented recording method, which may be inconvenient for long pieces of footage." At the push of a button, you can record your game footage straight to your USB storage device, including portable Hard Drives or USB flash drives..."
Answer: "No, this device will only record video input feeds via USB to either a USB thumb drive or hard drive." Thank you very much for your prompt service. The cable arrived the day after it was ordered - outstanding!! !